At the north-east corner of St James' Park. A sculpture of a winged figure of peace controlling a horse (the spirit of war). The sculpture surmounts a pedestal of Portland stone decorated with bronze frieze. The plinth is mounted onto a granite platform, with a curved stone wall and pillars situated behind. The wall and pillars feature bronze panels with dedications. Information shown: Surname, forename, rank. 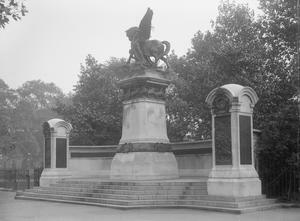 War Memorials Trust Bulletin No.57 (May 2013) Published:War Memorials Trust London Condition in 2012 described as 'fair'.